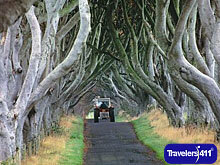 Visit the Travelers411 Directory listing for Northern Ireland Tourist Board. Alan Clarke, Chief Executive, Northern Ireland Tourist Board was on the July 22, 2012 "Travel with Stephanie Abrams!" Radio Show in hour 3. Visit the Directory for Northern Ireland Tourist Board. Alan Clarke was also on the July 21, 2012 "Travelers411" Radio Show in hour 3. Explore the many facets that make up Northern Ireland with Alan Clarke and Travel Expert Stephanie Abrams in this 30 plus minute interview. The discussion ranges from natural geologic sites such as Giants Causway to towns including Belfast, Derry, Enniskillen, Newcastle, Portrush and attractions such as the Titanic Belfast Museum local golf and fishing venues, Castle Ward, Mt. Stewart House and Gardens plus the region's music and other cultural offerings.